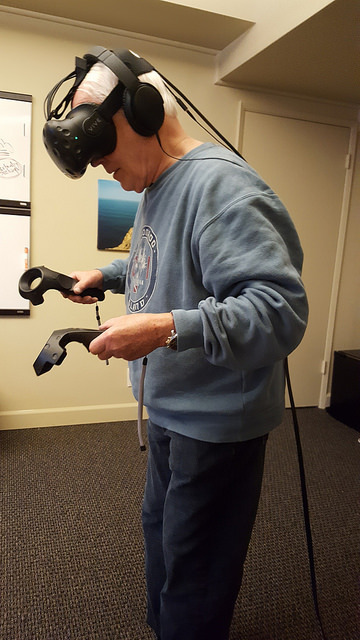 Dr. Goodman’s father trying not to fall off a high virtual ledge! Yet, my brain would not let my foot step off the cliff-side. That’s when I knew that this virtual experience could be used to help my clients face many of their fears directly in my office, conveniently and effectively. (That, and a growing body of research pointing to the effectiveness of using virtual reality (VR) exposure therapy). VR exposure therapy has been around for a while, but the costs for the early VR systems were extravagant while the quality poor. This year, substantially less expensive systems have hit the market. Additionally, these systems are far more powerful and immersive than the expensive VR of old. Arguably the most advanced and immersive VR system currently on the market, the HTC Vive provides intensely realistic anxiety-provoking experiences for my clients to challenge themselves with. During these exposures I monitor what they see and hear on my nearby computer. Once they are “inside” the virtual fear experience I communicate with them via a microphone that transmits directly into their headphones. In this way I coach them through adaptive coping strategies. …and a variety of OCD concerns. I do not use VR as a stand-alone treatment, but rather as a component of a more comprehensive treatment plan. It’s nice to have another powerful tool to help people face their fears. This entry was posted in Anxiety Disorders, Anxiety Treatment, Exposure with Response Prevention, Obsessive-Compulsive Disorder, Panic Attacks, Phobias, Social Phobia and tagged Anxiety, Anxiety Treatment, ERP, Exposure Therapy, Obsessive-Compulsive Disorder, OCD, Panic Attacks, Panic Disorder, Phobias, Social Anxiety. Bookmark the permalink. ← Is social anxiety an illness…really?